Japan's vision for the Pacific during World War II. 標準大東亞分圖 / Standard Map of the Great East Co-Prosperity Sphere. This is an important and rare full set of 20 maps from the 1943 Showa 18 World War II (WWII) Greater East Asian Co-Prosperity Sphere series. 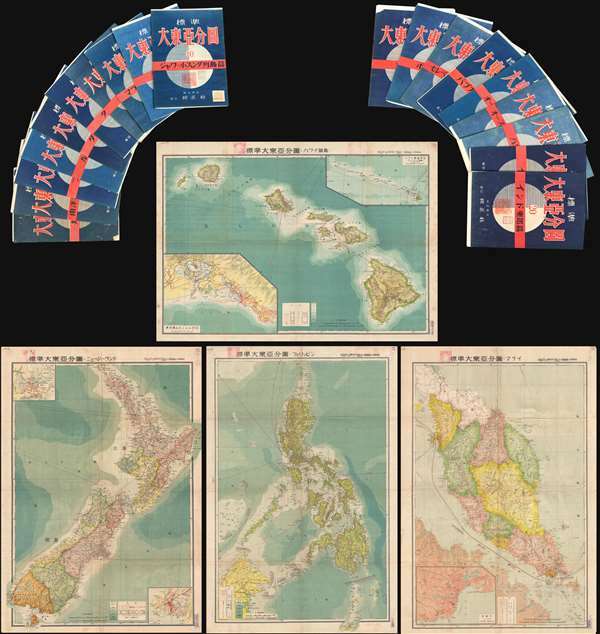 The series of maps covers from India to Hawaii and from Japan to Australia. Those areas of particular interest and important to the Japanese war effort, particularly Malay, the Philippines, Australia, and Java, are double mapped. The Co-Prosperity Sphere map series was published by the Japan Publishing and Distribution Company, Ltd. (日本出版配給株式會社). The present example is the second 1943 edition. Maps from this set do appear on the market from time to time, but a complete set is exceedingly rare. We have seen only one other. Very good. All maps come with original blue paper folders. Some are slightly more faded than others or may have wear and/or verso reinforcement on original fold lines or at fold intersections. Some have pinholes in corners. All bear title stamp and deaccession stamp. All maps measure roughly 21 x 29.5 inches.